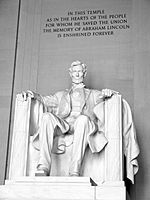 The Lincoln Memorial was built to remember Abraham Lincoln, who was the 16th President of the United States and led the nation during the American Civil War. It is in the National Mall in Washington, D.C., and is a popular site for tourists. The location on the steps where King delivered the speech is commemorated with this inscription. Lincoln Memorial Facts for Kids. Kiddle Encyclopedia.